Scenic designer Donyale Werle turned to prospective audience members for help creating the set of “Bare,” the Off-Broadway musical beginning previews at New World Stages on Monday, Nov. 19. In September, the Tony Award-winning designer (“Peter and the Starcatcher”) sent out word via Facebook and the show’s website that she was seeking Instagram images to create a collage that would serve as backdrop for the story about teens in a co-ed Catholic boarding school. What she got was some 7,000 responses -- mostly, photos people took of themselves. Werle and her team then duplicated the images, making 14,000 images, in order to fill the theater’s square footage. Werle says she took inspiration for the design both from church imagery, and from artist Damien Hirst, who repeats common items in his work. She was also looking to convey that “everything is a feed” in the world teens are coming of age in. “Computers are about lines, and grids and boxes, which led us to Instagram,” Werle said this week during an open tech rehearsal for the show, which hinges on one photo, in particular, that ends up changing a student’s destiny. The original incarnation of “Bare” debuted in 2000, in Los Angeles. 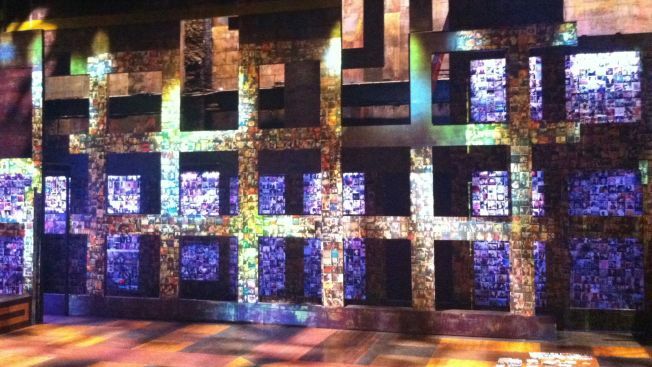 While most of the photo contributions for the set came from fans aware of the show’s history, the current cast and crew also sent in their own Instagrams, which also found their way into the design.